With four million people representing more than 140 different countries within its sprawling neighborhoods, LA’s food scene is known as one of the most diverse (and delicious) in the country. From late-night Korean BBQ after K-town karaoke to food truck plantains and pupusas outside your office, LA has never been shy about showing off its cross-cultural menu. The city has become so culinarily expansive that some of LA’s greatest go-to dishes have been melded into entirely new, and incredibly tasty, creations. What started with sushi burritos and short rib tacos has blossomed into a movement, so we created the ultimate LA mashup menu to help guide you through the city’s wide-ranging food scene. Bring your appetite. Traditional burger buns are so yesterday. Head into Mid-City or West Hollywood to ramen hotspot Tatsu Ramen, where they’ve transformed the classic, All-American burger into a homage to Tokyo ramen. A 100% Wagyu beef patty is topped with a soft-boiled egg and green onion and sandwiched between two slightly crispy noodle buns. Go the extra mile and dunk the ramen burger into their homemade Tonkotsu broth ramen. When you live in a city that has clearly set the bar for incredible tacos, of course you’re going to run into plenty of reimagined cultural takes. The latest LA taco craze is from a North African taqueria called Revolutionario near the USC campus. What started as a pop-up series by chef Farid Zadi has become a Jefferson neighborhood institution, exchanging carnitas and fajita peppers for tender smoked lamb, cilantro yogurt chicken, duck hash, and chickpea tagine. Throw in an extra 50 cents and get your corn tortillas stuffed with melted cheese, because why not? Everyone knows the best place to find authentic German sausage is in Koreatown. At least that’s been the case since the masterminds behind Biergarten Gastropub created this mash-up. The menu’s famous addition combines traditional German sausage with sauerkraut, peas, gravy, and scallions, topped with Sriracha to make sure it’s not totally out of place in K-town. You’re probably used to seeing dark molé luxuriously slathered over roasted chicken and pork, but leave it to B.S. Taqueria to take the iconic smokey-yet-sweet Mexican sauce and put it over french fries. Ray Garcia’s critically acclaimed hotspot might be known best for its Instagrammable, and unusual, taco pairings, but the molé fries, topped with chile vinegar and crumbly cotija cheese, is the hidden gem on the mouthwatering menu. You probably already know poutine, Quebec’s epic French fry dish, but have you ever tried the Indian version of the classic Canadian comfort food? The Indian-Canadian owners behind Badmaash made this cross-cultural mash-up a reality. 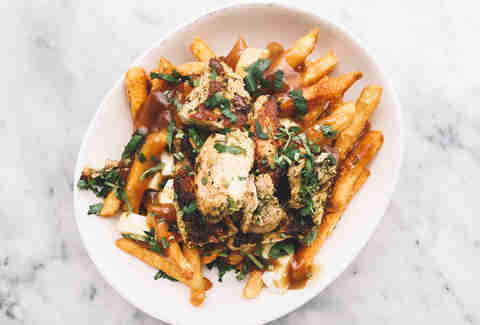 We’re talking masala fries topped with the traditional cheese curds and beef gravy you expect from poutine, but twisted even more with traditional tandoori chicken tikka marinated in yogurt, spices, and cilantro. Los Angeles isn’t known for its Italian food, but Pasta e Pasta by Allegro is the Italian-Japanese restaurant that’ll make you respect LA’s creativity. Instead of the traditional Italian pasta smothered in olive oil and butter, you get Wafu, a Japanese-style noodle dressed with dashi broth, soy sauce, sweetened rice wine, and mushrooms. With that in mind, you need to try the uni pasta: sea urchin, anchovies, tomato, garlic, and cream sauce. To drive it home, you can have Italian wine or Asahi Japanese beer on draft. 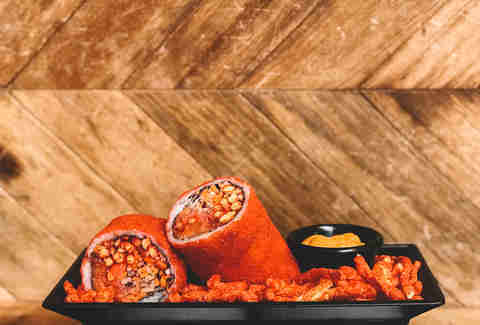 Just when you thought the sushi burrito couldn’t have any more flavor layers, the chefs over at Okipoki in Little Tokyo, known for their creative poke bowls and sushi burritos, created an eyebrow-raising menu item known as the “Inferno” burrito. The name becomes much more appropriate after you bite into this custom creation stuffed with spicy tuna, caramelized onions, house slaw, sesame peanut sauce, and Flamin’ Hot Cheetos. Trois Familia, which effortlessly blends Mexican, French, and classic American comfort food, is worth a trip to trendy Silver Lake. From hashbrown chilaquiles to double-decker potato tacos, brunch here is a religious experience for those who went a little too hard the night before. Usually we’d advocate for the savory route in these situations, but it’d be an absolute brunch blunder to skip the Churro French Toast, topped with Mexican chocolate and west coast favorite Salt & Straw vanilla ice cream. Silver Lake’s cozy Bowery Bungalow features everything from shish kabobs with pork belly to Moroccan couscous, but their baby back ribs rubbed with middle east spices, Turkish coffee, and grape molasses is the mash-up you need in your life. 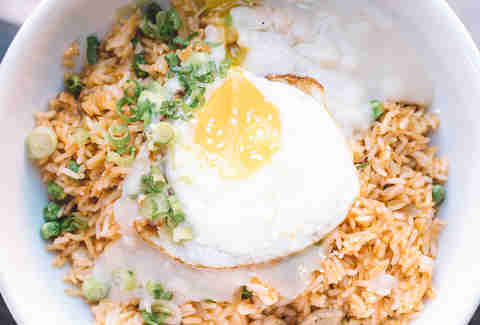 Plus, the inspiration for everything on the menu comes from the owner’s mother’s and grandmother’s cooking that he grew up eating, so it tastes like home no matter where you’re scarfing it down. Chicago’s Wrigleyville might do hot dogs with stadium mustard the best, but leave it to LA to make hot dogs a cuisine-crossing foodie phenomenon. 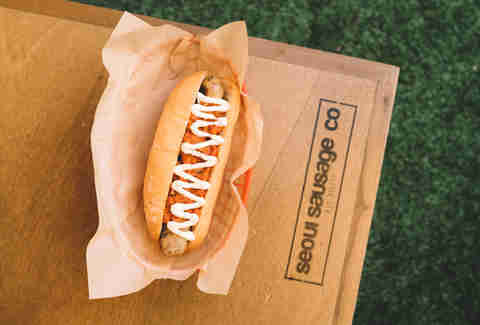 Downtown’s Seoul Sausage takes its Korean street food expertise and turned the classic American hot dog into mashup bliss. Our advice: Get the Kalbi Pork Dog, which combines kimchi, fried shallots, and garlic jalapeño aioli. Century City has the greatest French-Japanese mashup in the city, and it comes stuffed inside a baguette. Executive chef Brandon Kida combines his Japanese heritage with his French culinary techniques to make a truly epic uni baguette. 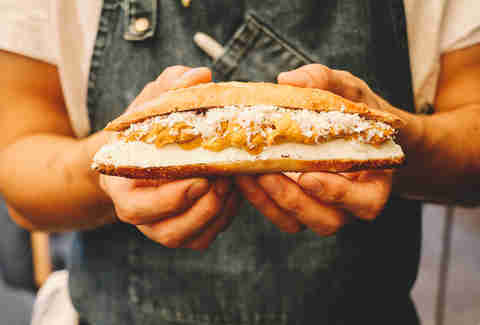 We’re talking sea urchin with house-made ricotta and local honey on the classic French bread. And the super sleek outdoor patio with a wooden pergola and ivy-covered walls isn’t the worst place to hang out and eat it, either. 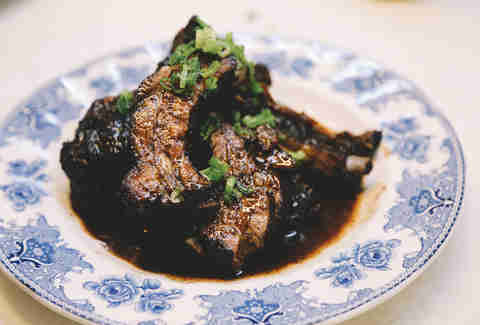 You’ll find the usual Korean pork belly and gabi (Korean-style beef short ribs) at Sapor, but the trendy gastropub in K-town reinvented a few classic Italian dishes while borrowing a few plating tricks from Spanish cuisine to serve part of its menu tapas style. Don’t get us wrong -- the entrées are incredible (we’re looking at you, squash sandwich with smoked mozzarella), but this is the place to bring your squad to go in on sharing plates, like tender pork belly with pear mostarda, fried portobellos with aioli, and half a dozen oysters with fennel citrus mignotte. Shout out to all the vegetarians out there because you’re in luck: LA is known for having some of the tastiest veggie-only options. 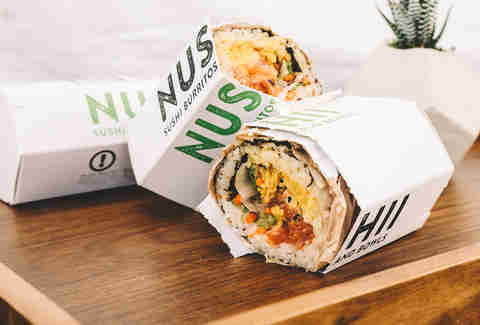 So it’s no surprise that there’s a Mexican burrito that combines organic braised tofu with a Japanese curry aioli that’ll make your head spin from all the flavor -- especially one built for vegans. When seasoned right, tofu can be just as satisfying as carnitas, and Nushii’s tofu, marinated with hints of lemongrass, will definitely satisfy even the most stubborn carnivores. 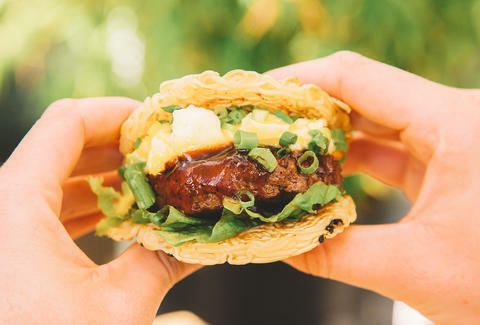 This wouldn’t be an LA mash-up list without Kogi BBQ. What once was just a solo food truck that parked outside clubs late at night became a Korean-Mexican food revolution in the city. 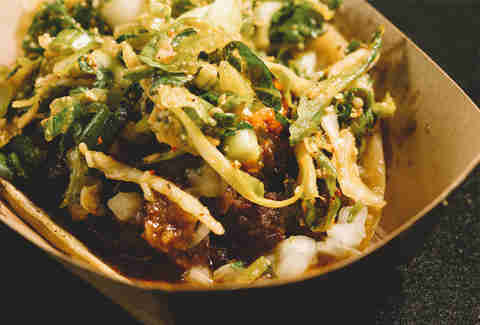 Roy Choi and Mark Manguera thought putting Korean short rib in a taco would be a great idea, and four trucks and a restaurant later, Kogi BBQ has become an LA institution. Known as “The Elote,” Rose City Pizza’s take on classic Italian pizza is incredible because it taps into our obsession with salty, buttery Mexican street corn. The pizza is topped with buttered corn kernels with spicy mayo, chili powder, and cilantro, and then drizzled with mozzarella and Parmesan cheese to mash up both cuisines together into one, wonderful pie.